Welcome To The Wonderful World of OffShoreTrips And Costa Rica Fishing! Here, the billfish jump out the water and days of powerful line fishing await you. You owe yourself this awesome experience at least once in a lifetime. You may come back many times. The water is warm and the climate’s great. It is time to take a Costa Rica fishing charter. Just wait until you hook the big one and the fun begins. We have all the fish species you could dream of. Each one is a fighter worth a prize and a spectacular battle to win. Nearer inshore, our Costa Rican fish include our very own Costa Rica Roosterfish, barracuda, crevalle, mackerel, snook, snapper, and jack. Further out in the deep blue ocean our Costa Rican fishing charter opportunities center around Costa Rica billfish, such as the magnificent Pacific sailfish and marlin – and their equally spirited partners the amberjack groupers, mahi-mahi dorado, mackerel, tarpon, wahoo, and yellowfin tuna. You have no end of opportunities to choose from when you go out on the deep blue tropical ocean with us. What will it be today: Costa Rica tuna fishing or Costa Rica Marlin fishing? You nominate the choice. We check the reports and schedules. Then we go out and get them! The Costa Rica weather is so great you could almost say we have summer all year round. The climate is hot and dry with average temperatures of 70 to 81 F (21 to 27 C). The peak fishing season and time for our breathtaking competitions are from December through to April. After that, cooling rains arrive to keep our legendary rain forests emerald green. 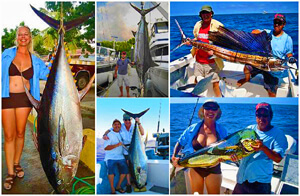 Our Costa Rica fishing charters go out throughout the year in search of mighty sporting fish. These are in abundance all year round. The only difference between May and November is the pressure off the booking schedules now the crowds are gone. We provide year round marlin fishing in Costa Rica. The choice is absolutely yours. 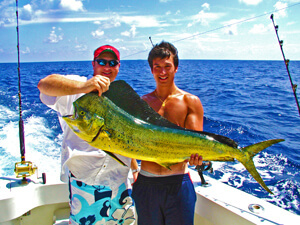 Whether you want Costa Rica snook fishing or Costa Rica mahi-mahi fishing, we find the captain and book the boat. 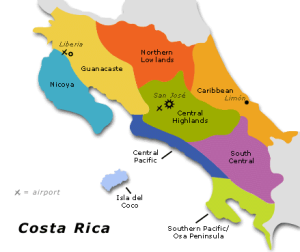 We are native Costa Ricans, and we live in Costa Rica. We understand the climate, and we know the fish. Why use some foreign agent to book your fishing charter that may not even have been here. We are the experts when deciding whether Costa Rica sailfish fishing is the best option before our boats set out. This knowledge will show in your catch. You could be forgiven for thinking you were living on a tropical island were it not for the huge array of Costa Rica fish species. The world’s top sports anglers flock here especially from December through to April when our legendary fishing tournaments take place. Our proposition is ‘fish hard, play hard’. After a day of the marlin fishing, Costa Rica is famous for we recommend a fine hotel, or characterful fishing lodge where you can hang up your fishing tackle and crack open a beer. The names of these fabled regions are so musical they roll off the tongue. 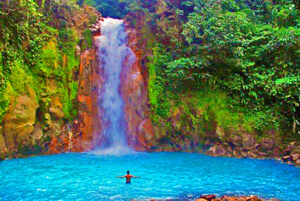 Los Suenos and Quepos, Jaco and Papagayo, Tamarindo, Nosara, and Samara are all good places, but how will you choose. Your answer is simple: Ask Offshore Trips for advice, and we provide it free with our compliments. As we said, we live here. We know this place. We know the resorts. Which one has the best steaks, which one is good for kids, etc. Some skippers specialize in hunting down particular types of fish in Costa Rica, for example, Costa Rica wahoo fishing or Costa Rica Marlin. Others have a broader palette and assist according to what their customers ask. And then there is also the question of the boat. Some are smaller, catering for groups while others take all comers. Offshore Trips knows what’s available and which skipper works out of which Costa Rica fishing resort. We make suggestions; you decide and book, we make it happen. It’s as simple as that! Follow The Fishing And Boating Action!